Today’s ONE: Hero’s Ascent saw a new flyweight champion crowned. 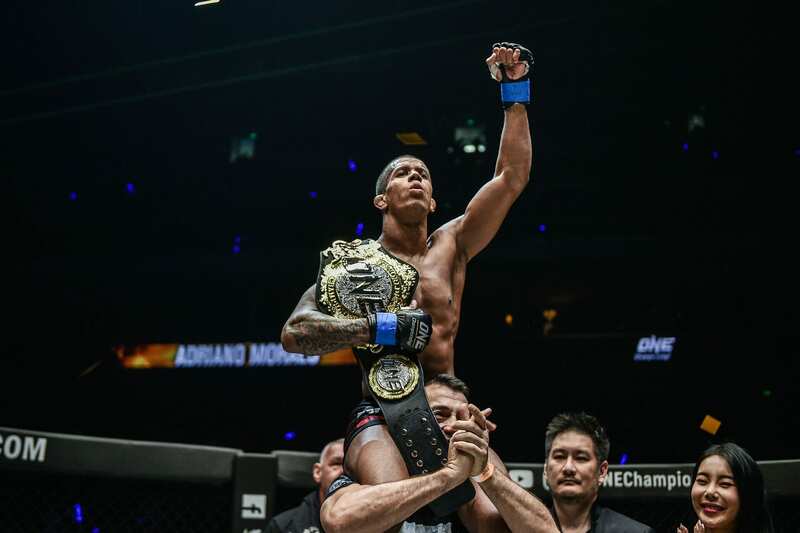 Adriano Moraes recaptured the title he lost to Geje Eustaquio last June with a unanimous decision victory. Inside a sold-out Mall Of Asia Arena in Manila, Philippines, the pair faced off for the third time in their careers. Throughout the five rounds, both men had their moments. Moraes dominated the fight on the ground while Eustaquio controlled the stand-up exchanges. A cagey opening round was followed by an exciting second during which the bout transformed into a predominantly grappling contest. Thirty seconds into the second, Moraes took Eustaquio to the ground. Eustaquio was able to get to his feet but not without Moraes taking his back. 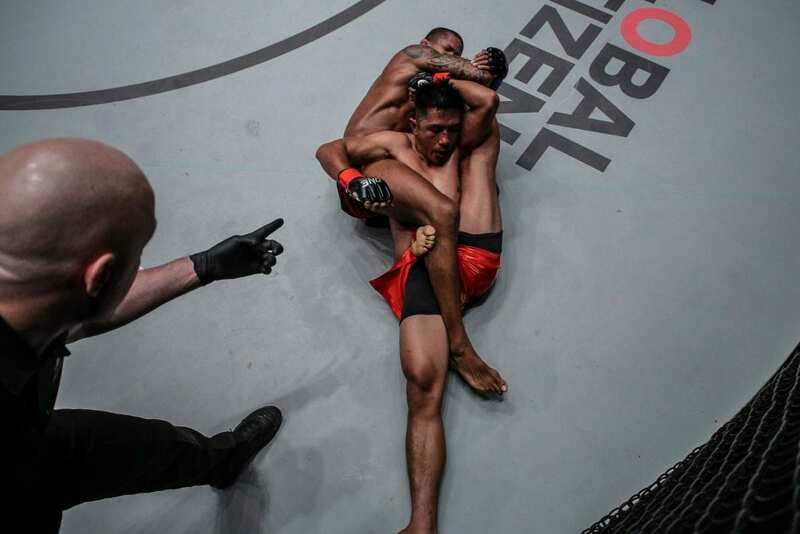 The Brazilian began working on an armbar submission attempt, but in doing so allowed Eustaquio to reverse positions. The rest of the round involved a series of entertaining scrambles as both fighters jockeyed for position. Going into the third, Eustaquio looked more relaxed and confident, and it showed in his movement. The Filipino started the round with a stinging sweeping leg kick and followed it up shortly after with a Superman punch off the cage. Each minute the fight stayed standing lessened Moraes chances of claiming the title. The 30-year-old upped the tempo in the fourth, finally getting the takedown he was looking for. Eustaquio soon found himself in an extremely precarious position. Moraes caught the champions left leg and proceeded to bend it straight back behind the Filipino’s head. It was painful to watch and must have been more painful to have experienced, but somehow Eustaquio survived the round. The result was still up in the air leading into the fifth. 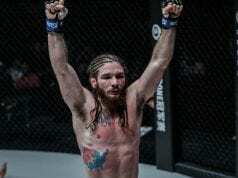 However, at the halfway mark Moraes achieved a takedown and set about securing his victory. The ONE Lightweight Grand Prix’s opening quarterfinal was a short, one-sided affair with the returning Lowen Tynanes submitting Honorio Banario in the first round. Coming into this bout, a question mark hung over Tynanes. The undefeated Hawaiian had not fought since 2016. At the time, he was shaping up as a title contender, but injuries forced him to have an extended spell on the sidelines. However, any concerns about Tynanes losing a step due to his injuries disappeared once the fight started. The former state wrestling champion exhibited no signs of ring rust following his lay off. Two minutes into the bout, Tynanes took Banario down in the center of the cage. 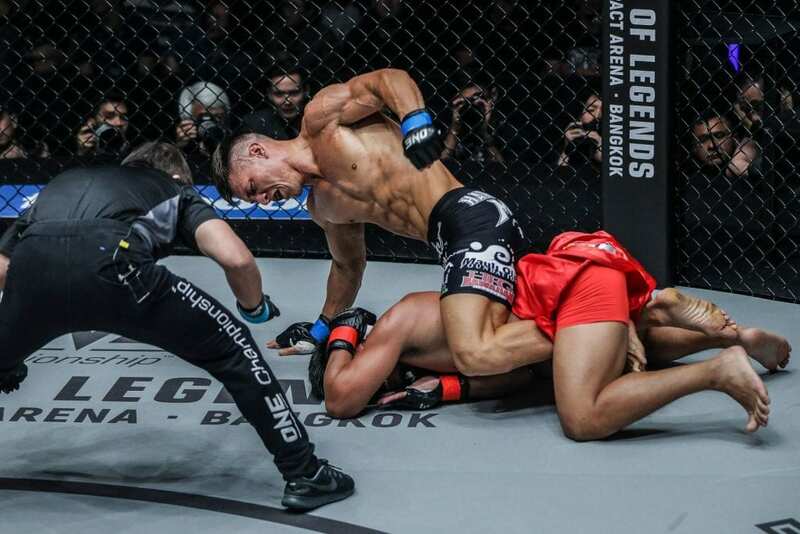 Banario fought resiliently to get back to his feet, but Tynanes was too strong and technically too sound to allow the Filipino any room to maneuver. After softening up Banario with series of increasingly powerful strikes, Tynanes took Banario’s back and began raining down a steady diet of unanswered blows. The referee was forced to step in and halt proceedings with 10 seconds left in the round. Tynanes now finds himself one result away from what could be the biggest bout of his career. The Lightweight Grand Prix bracket was released yesterday, and Tynanes is slated to meet the winner of Eddie Alvarez and Timofey Nastyukhin. He may have been out of action for longer than expected, but Tynanes has timed his return perfectly. Thailand’s Rodtang “The Iron Man” Jitmuangnon dominated Tunisia’s Fahdi Khaled in their three-round flyweight Muay Thai bout. The gape in class between the pair was evident from the outset. Rodtang, a two-time Omnoi Stadium Muay Thai World Champion, appeared impervious to any strikes thrown by Khaled. The 21-year-old continually walked down his Tunisian rival, backing him against the cage before unleashing thunderous leg kicks. As the bout wore on Rodtang became visibly frustrated at Khaled’s refusal to stand and trade with him in the center of the cage. However, it was likely this refusal that allowed Khaled to go the distance with his much more experienced opponent. It could be argued that the Thai had it in his powers to force the action and chase the stoppage with more intent, but that would be looking for flaws when in all honesty there were none. The question now turns to who ONE can find or bring in capable of posing a genuine threat to Rodtang.